I find that in some way or another everything circles back to food for me. Big surprise, right? Anyway, recently, late at night, I was reading an article about all the controversy surrounding England and Brexit. When I woke up the next morning, I had a craving for a certain kind of wheatmeal biscuit my husband and I loved during a long ago trip to the UK! And that, in a nutshell, is the strange thing I call my mind. Now, not to undercut the seriousness of the Brexit issue, but as I have no solutions (nor does it seem anyone else) it’s time to talk about something I do know about, and that are these wonderful homemade wheatmeal shortbread cookies. Let me introduce you to our utterly delicious cousins across the pond. Who doesn’t love the rich, buttery melt-in-your-mouth delight of shortbread. Though there is not a lick of chocolate in sight, I find these irresistible! 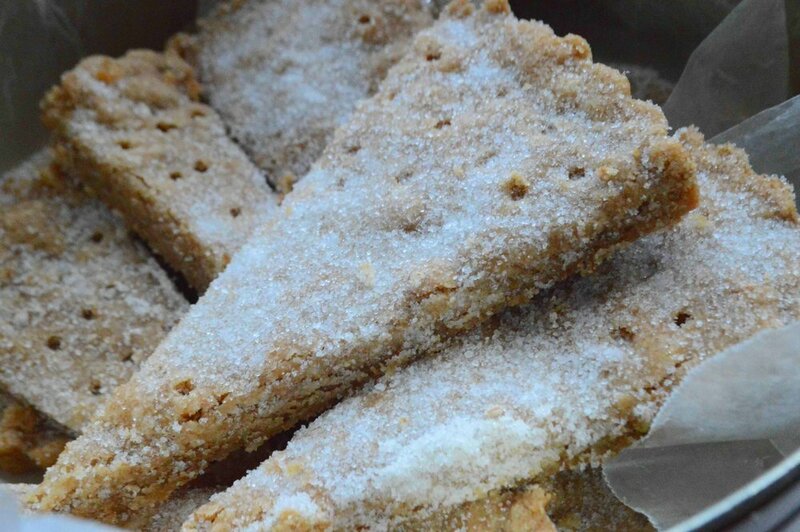 Part of what separates these from traditional shortbread is that these contain a significant proportion of whole wheat flour and wheat bran, which gives them a hearty earthiness. Now, I’m not claiming these are healthy—there’s also a significant amount of butter in these babies too, but they are so, so worth it! Wonderful with a cup of tea! And easy to make too. The dough comes together quickly and then you simply press it into a springform or tart pan. 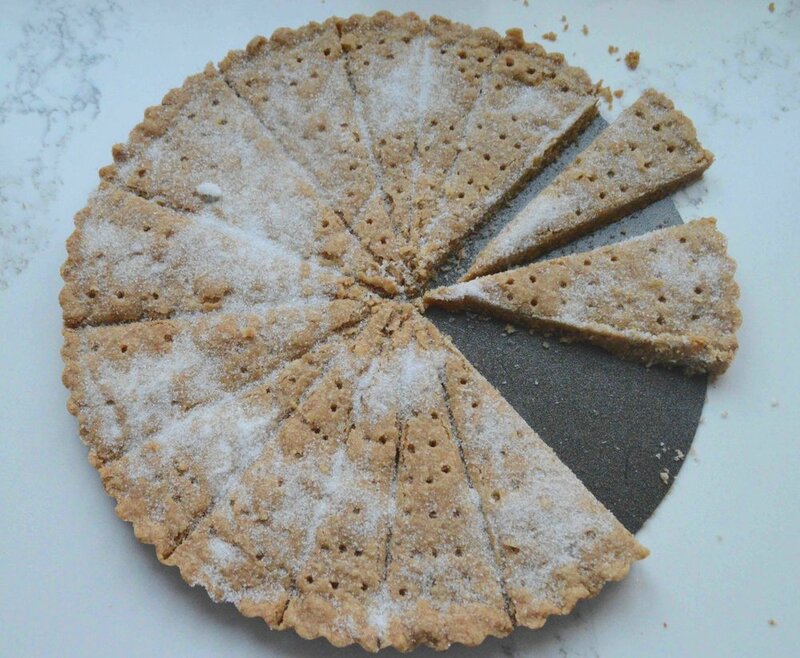 Once the dough has baked for about 30 minutes, you remove it from the oven, score the circle into wedges and poke holes in the wedges to release steam and get that iconic shortbread look. After the second bake, you sprinkle the top with sugar to help get that sweet crunch. Guys, these are just crazy delicious. I know I’m about a month too late, but a tin of them would make a great holiday gift—I’m definitely going to remind myself to do that and in the meantime, I’m going to keep dunking! 1. Preheat oven to 325º F. Set aside a 10-inch springform or tart pan with removable bottom. 2. Use an electric mixer to mix both flours, the wheat bran and salt together on low speed. Add the butter and brown sugar and beat at medium speed for a few minutes, until a smooth dough is formed, scraping the bottom and sides of the bowl as needed with a rubber spatula. 3. Turn the dough into the pan and use your fingers to press it into an even layer across the bottom only—not up the sides. Sometimes it helps to take the bottom of a glass and press it onto the surface to help smooth things out. 4. Place the pan in the oven and immediately reduce the temperature to 300º F. Bake for 30 minutes, until the edges are just beginning to get brown. Then, remove the pan from the oven and use a bench scraper or sharp knife to cut the dough in half, then quarters and then eighths so that you wind up with 16 wedges in total. Now use a wooden skewer, chopstick or the tines of a fork to prick the shortbread all over in some sort of decorative pattern. Return the pan to the oven and cook for another 15 minutes or so, until the cookies are golden looking. Remove the pan from the oven, transfer to a wire rack and immediately sprinkle with the granulated sugar. 5. When cookies are completely cool remove the bottom of the tart pan or sides of the springform and cut into wedges. Store in an airtight container at room temperature for up to one week, if you can actually make them last that long! Note: Adapted from Martha Stewart’s Baking Handbook. The original recipe calls for you to cut these into 8 giant cookies—I think they’re too large and indulgent that way so I cut them into 16.